Not to be confused with budget banner stands offered by our competitors, our roller banners are superior quality and built to last - not to let you down on your important event. The price includes a full colour graphic printed on an anti-curl polypropylene for excellent durability. These banners take literally 20 seconds to put up - simply pop in the telescopic pole, roll up the display graphic and clip it in! Comes with a FREE carry case/ holdall. 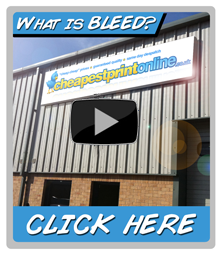 Click below for a template on how to produce your banner. Premium quality 800mm wide by 2000mm high. Printed to one or both sides in full colour onto anti-curl polypropylene. For quantity discounts, please call us on the number above. Cheapestprintonline.co.uk has been supplying cheap roller banner stands and cheap rollup banners at the lowest prices for over 15 years. We specialise in all types of roller banner stands, cheap rollup banners as well as business cards, matt laminated business cards, letterheads, compliment slips, stationery printing, poster printing, booklet printing, brochure printing and pretty much anything printed on paper or card! We can offer our roller banners next day or 24hr roller banners, or for the cheapest roller banners – 5 working days. All our roller banner stand production is carried out in-house using state of the art printing presses at our Leicestershire based factory - ensuring we have total control of your roller banner or roll up banner stand printing at all times. Offering cheap roller banners or rollup banners online does not mean we compromise on quality - far from it, we only offer high quality roller banners and quality fast banner stands which is why we have been the UK's leading roller banner stand and roll up banner stand specialists for the last 3 years. Whether you are ordering roller banners, banner stands, rollup banners or flyers, you will find our customer service exceptional, friendly and courteous at all times - after all, our team is here to help you, the customer! 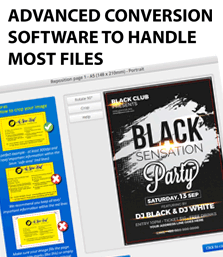 Why choose roller banners/ rollup banners to promote your business / event ? Roller banners are also known as roller banner stands, pull up banners, roll up banners, retractable banner stands, roll up banners and banner systems. They are great for promoters or event organisers requiring a lightweight, highly portable, compact, lightweight, expandable and reusable display. Our Banner stands or Rollup banners are free standing. 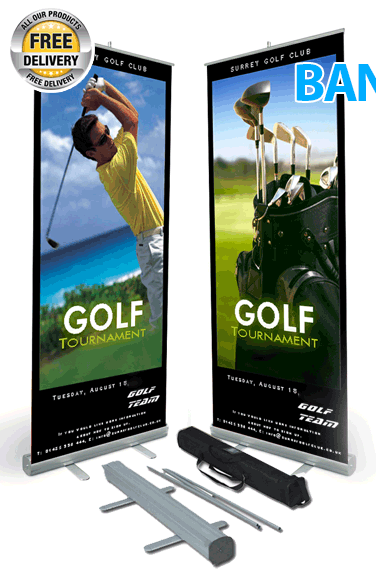 Roller banners are lightweight and very portable because they don't have heavy framework. Cheapestprintonline offer high quality banner stands and roll up banners / roller banners for cost effective outdoor and indoor advertising. Not to be confused with budget banner stands offered by our competitors at under £60, our roller banners are superior quality and built to last - not let you down on your important event. The price of our roller banners or banner stands includes a full colour graphic printed on an anti-curl polypropylene for excellent durability. These roller banners or banner stands take literally 20 seconds to put up - simply pop in the telescopic pole, roll up the display graphic and clip it in, Our roller banners also come with a premium banner carrycase/ holdall. Cricket Banner Stand, Grasshoper Banner Stand, Pacific Banner Stand, Mosquito Banner Stand, Axis Banner Stand, Orient Banner Stand, Orient Banner Stand, Outdoor Blizzard Banner Stand, Supreme Banner Stand, Sigma Banner Stand, Barracuda Banner Stand, Sidewinder Banner Stand, Double Sided Banner Stand, Pegasus Banner Stand, Lite Banner Wall and Twist Banner Stand. The most popular roller banner is the one we keep instock which we simply call the premium banner stand or premium roller banner, this is because it is simply a premium roller banner stand and not just a cheap banner stand. Getting your design right for your roller banner or banner stand is a priority - a poor design will just get ignored and walked by! Rather than just having a roller banner or banner stand with a quick 'DIY' design you would get a far better response from a professional designed roller banner or banner stand, we offer roller banner design from only £30. Keep your banner stand or roller banner design simple, whatever it is - you only have a limited amount of time to get your roller banner or banner stand noticed, remember first impressions count! Use a reliable printer.. when you order your banner stand or roller banner online you want it quick - strike while the irons' hot! Use a fast printer who can offer same day roller banners, next day roller banners, 24 hour roller banners, you will pay slightly more for same day despatch but think of how much more revenue you will take if you can get your roller banner up doing its job so much quicker by using a next day printer! 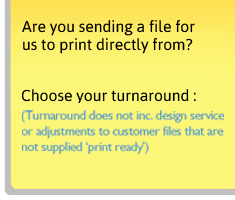 We offer 3 turnaround speeds on our roller banner stands to suit all budgets. We are one of only a few printing companies who can say we offer next day roller banner printer or next day roller banner stand printer offering 24 hour printing, 3 Day turnaround printing, and 5 day turnaround printing. For cheap roller banner stands you can use our standard 5 day turnaround which means we will despatch your roller banner stand order in 5 working days. This service is ideal if you are not in a rush for your cheap roller banner stand or cheap roll up banner and just want the cheapest roller banner online. We also offer 24 hour roller banners and 24 hour rollup banners, if you order before 2pm we will despatch your quality roller banner in 24 hours later so you receive your 24 hour roller banner stand or 24 hour rollup banner the following working day by guaranteed next day delivery.